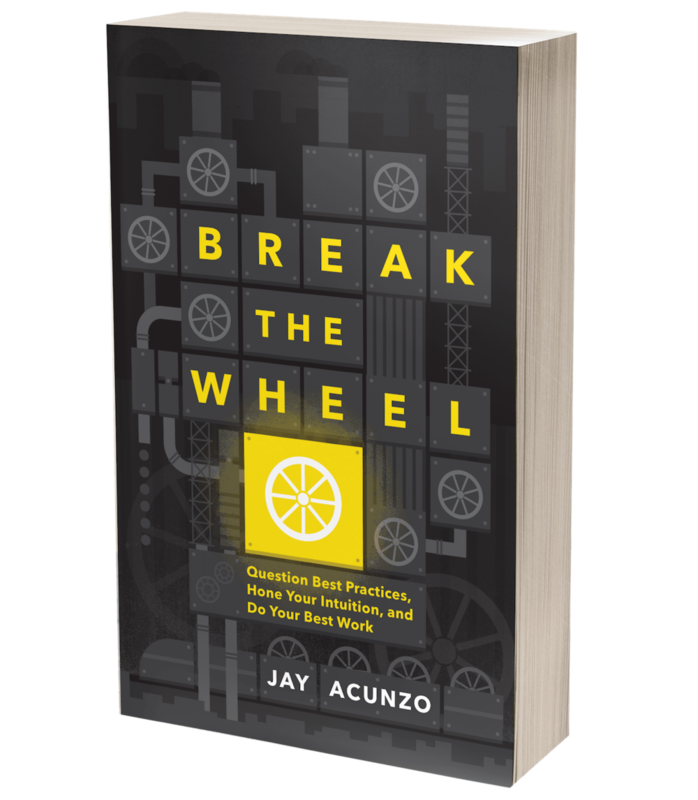 No Audience, No Problem: Run the Content Marketing Wheel to Launch & Grow — Jay Acunzo | Author. Speaker. Maker of Shows About Work. Admittedly Ridiculous Disclaimer: This post talks a lot about my own work, which I don't love doing. I genuinely hope this comes across as helpful and not self-centered. To be honest, I can't stand those headlines wherein the author claims, “Get 5,783 Downloads By Doing Exactly What I Did.” Let’s face it — you won’t get 5,783 downloads by doing exactly what they did. That writer lied to you. To gain clicks. And it probably worked. But here’s the thing: Reading about the specifics of someone’s work is actually the best way to learn. Unfortunately, the marketing industry is rather full of entirely meaningless babble like, “Content can take your customers on a journey with you to fall in love with your canned tuna!" Nope! Not now. Not ever. Every so often, I feel a similar sense of foreignness creep into my work when it comes to the content marketing advice I give to others. Over the last few years, as I’ve gotten more excited about this industry niche, I’ve tried to write more, speak more, and teach more — all of which means I’m saying more of the same things in different places. So you can understand my unspoken (until now) self-doubt when I joined NextView Ventures in the spring of 2014 and decided to launch a go-to blog for seed-stage startups: The View From Seed. Here's what happened that made what SHOULD have been straightforward and familiar to me (content marketing) suddenly sound somewhat ... off. In July, when we launched the blog, I was utterly thrilled. It looked slick and clean. It had a strong mission and clear niche to own (seed stage startups, i.e. the first 18-24 months of web and mobile tech entrepreneurship). I was PUMPED! But then — oh, right — nobody else cared. Our audience didn’t care because there was no audience. Thus, it was time to listen to the same advice I'd given dozens of times to other companies and individuals on how to launch a content marketing strategy and grow an audience. It was time to start building my very own mini content machine. Unfortunately, as soon as you get incredibly close to any problem, even your own words start to sound foreign and strange. So I began to question my own advice and my own playbook. Granted, I'd done this before, both at a startup and at a larger, now-public tech company. But at NextView, I am quite literally a one-man shop. We don't use vendors. We don't have blog support. It's alllllll on me. THAT was a first. THAT was kinda sorta scary. So, after much wringing of hands and sipping of bourbon, a took a deep breath, and I decided to see what happened when I listened to my own advice. Below, I’m sharing the exact steps I took to follow the playbook I'd created for all my talks and teaching. Not only did these steps actually work for NextView's blog (oh thank God), I know that over-sharing these here can help you adopt some or all of it and see better results. I’m a huge believer in running what I call the Content Marketing Wheel. This is a hub-and-spoke approach to content creation and distribution. I first came up with this way to visualize and execute content marketing when I worked as head of content for HubSpot and was asked to teach our methods to others. For context, HubSpot publishes 3-5 blog posts every day, creates 4-6 longer form resources each month, and has built an audience of 2M+ monthly readers and 300K+ subscribers. When explaining content marketing to others, I try to keep the common reasons they struggle in mind. Most commonly, companies fail because they simply stop. It’s hard to sustain. Other times, they might create a piece that’s truly great but doesn’t get any attention because they fail to actually market it. Lastly, many businesses create content that drives vanity metrics like views and shares, but they fail to actually convert people and prove ROI -- whether because they're measuring the wrong things or they literally can't get their audience to take those tangible actions. The Content Marketing Wheel addresses all of these challenges. It's easy to understand, applicable to any company regardless of size or sector, and built to sustain, promote, and generate returns from your work. This simply can't be overstated -- a good content offer MUST achieve BOTH of those things. Identifying a buyer’s problem dictates the topic you address in a given resource, while your marketing goal helps you determine the format or medium for that piece. If your goals were awareness and press rather than lead-gen, the topic still stays the same (business blogging is still hard for your customers). But the format changes to better fit those marketing goals, perhaps in the form of an infographic or research report about blogging -- both more adept at getting press pickup and broad distribution when compared to a gated PDF. That's the central content offer -- the starting point to this Wheel. Once you've created that, every single other tactic exists for ONE REASON: drive traffic back to that core resource. Think about the concepts of REACH and RESONANCE. The tactics around the wheel build reach -- they're built to generate traffic, shares, and other similar activities. They "sit" where audiences live. The resource in the middle, on the other hand, is all about resonance. It solves a core problem for your buyer or, for many B2C companies, helps fulfill a similar emotional desire to the product. The interchange between the two help you sustain your publishing AND convert vanity metrics like views into tangible ROI. Here's exactly how I ran the Wheel back in July 2014 in order to start growing The View From Seed, starting with a powerful content offer. The offer I created was a board deck template for seed-stage startup founders to use with their board of directors and advisors. You can download the PowerPoint file here or read the launch blog post here. To identify an offer worth creating, I asked the NextView partners what question they get most frequently from our startups that we might address through content. Immediately, all three mentioned board decks. While it's always a good idea for startup CEOs to discuss and set a slide template with their board, it’s not always clear how, exactly, they should package information into their decks. This is particularly difficult during the seed stage of growth, when there aren't tons of charts and graphs going up-and-to-the-right quite yet. Additionally, some founders we invest in are first-time entrepreneurs and may not have experience running a board meeting -- not to mention their probable lack of design resources. Thus, on several levels, this template makes a ton of sense to help solve their problem of board deck creation. And since our goal was initial awareness for a new blog, we did NOT gate the piece behind a form. We wanted it to spread far and wide. 10,000 views of the templates and 1,100 downloads in the first two days. Discovering that one prominent VC who tweeted it also emailed a listserv of 500 tech startup CEOs — an incredibly high concentration of the very narrow audience we wanted to reach. Okay, now the good stuff: What did I do to run the Wheel, and how can you repeat it? When I began running this playbook at NextView, to determine a problem facing our audience (tech startup founders), I simply asked the three partners of my firm for their take. But I highly suggest talking to actual customers and customer-facing teams at your company. When I led content at HubSpot, for example, I benefitted from a large customer support team. To generate better ideas as a content team, we'd look at a monthly log of their tickets, which were tagged by topic. One example that came up frequently was “content creation is hard." Perfect! We can create multiple offers and related blog content and be reasonably assured of its success rate. From there, we'd brainstorm resources to help. I started by collecting a few good examples (mostly from the NextView partners, who sent me some board decks they’d recently received upon my request). Next, I wrote down or saved the common elements found in each deck, as these were likely best practices a founder would expect to find in the deck template. I also saved any formatting or design flourishes I liked and could copy in my own layout. After that, I created a rough PowerPoint outline (copy only, no design). With that in hand, plus a list of questions that arose when I was doing my research and outlining, I sat with one partner for 30 minutes to review. This was the same partner I’d asked to be the “executive sponsor” in the initial discussion about the project -- a tactic that helps me avoid the need to build too much consensus or have too many cooks in the kitchen, which would slow my progress. The executive sponsor is the "buck stops here" person. After getting that initial, overarching feedback, I then drafted a more complete version, focusing on both copy and design. I did one more 30-minute review session with the same partner/executive sponsor. I then emailed the final draft to all three partners so they could see it prior to launch. The entire process took about two weeks since I was also balancing other projects (again, I’m a one-man shop). Once you've built that core resource, it's time to make that piece do lots of work for you to grow audience and yield a return. That's where the other tactics come into play. You can start anywhere along the outside of the wheel, which is part of its beauty -- it's easily tweaked to fit your resources, your needs, and the specifics of your content and business. Atomization, for those unfamiliar with the term, is the act of creating lots of related pieces of content all based on a larger, central piece. An ebook, for instance, can and should yield a handful of other pieces, like blog posts, social sharing graphics, SlideShares, and so on, all thematically similar to the core resource. A launch blog post — one blog post talking specifically about the offer. You should do this every time you launch a big resource. There's no need to get cute here either. Just create one post that announces its launch. A SlideShare — to tap into an audience of millions that already exists elsewhere, away from our blog. The slides contain a few links back to the original resource and our new blog. Unsurprisingly, this piece generated more views (18,000) than the blog post did (10,000) across the first few weeks. The blog posts and SlideShare each contained shortened hyperlinks (using goo.gl) to direct traffic to the board deck templates. Again, in this playbook, you need to think about reach and resonance. The content you create around a core resource should be built to grow reach and drive traffic, while the central resource should be built to resonate deeply as a solution to customer problems. The shortened link helps track the movement of audiences between things. Day 1 of the “launch” meant publishing the initial blog post discussing the content offer and starting heavy social media promotion. Immediately shared on Twitter via our firm’s handle and my own. I used the Twitter graphic I’d already created to attract more attention in both cases. Overall, I tweeted the link multiple times that day and week from @NextViewVC. The more active and fast-paced the feed of a certain social network, the more you can post. Use good judgment to avoid feeling spammy however. Consider your own reading habits to help make that call -- you probably dive into a Twitter feed at various times throughout the day, which means you miss lots of tweets that happened earlier. So you wouldn't mind a repeat tweet since it likely feels new to you. Conversely, tons of similar posts on Facebook does feel spammy since each post is bigger and people tend to post fewer times in a day on that particular network. To boost reach out Twitter, I also emailed the blog link to the three partners, who have around 40K combined followers. I drafted three “lazy tweets” they could easily copy and paste into Twitter to share. These are simply pre-written copy plus the blog post link. Providing these lazy tweets encourages more sharing from folks you email -- a trick I learned at HubSpot. When the blog post was published, it was also auto-posted to several LinkedIn Groups. I use Zapier (similar to IFTTT) to set up a rule so that a new post on The View From Seed gets shared from my LinkedIn account into several startup-focused Groups I've joined. This drives significant traffic back to us. I also shared the post to Quibb. This is a closed, application-only community of tech industry professionals that acts like Reddit. You can share links, upvote, comment, follow people, and so on. Finally under social media, I looked at Quora for people asking questions about what makes a good board deck. When I found something relevant, I would actually type out an answer! Nothing feels more spammy than simply saying, “We answered that here: [URL].” Instead, I’d pull the answer or re-write it from the blog post, then say, “FYI, I pulled this out of this resource [URL], which includes more advice and a template for board decks that my VC firm created. Hope it’s useful!" If you can't tell, I hate feeling spammy, so this helps me feel more human (I think/hope!). Next as I turned the wheel, I emailed the launch blog post link to our blog subscribers -- an admittedly short list for our young site at that point in time. To continue email promotion, I also contacted 10-20 people in our networks that would find this content useful for their work (including our CEOs). Additionally, I emailed 10-20 others that weren't the direct target audience of this deck but instead worked with or advised that audience. Since the intended audience here was startup CEOs, we sent this to a few tech startup incubators and accelerators, co-working spaces, or other VCs who often partner with us that might gladly share this on social or through email with their founders. In both cases, I ended with a friendly, "All feedback and social support much appreciated. If you were planning to tweet this, I wrote 2-3 pre-written versions to make things easier for you. If not, would still love your take on this project. Thanks!" This one takes some explaining. "Third Parties" is my catch-all for organizations or sites where audiences already exist -- aka audience outposts. These include sites like SlideShare, Medium, and LinkedIn's blogging feature. In these cases, you have access to publish at will. But this third party category also includes PR, influencers, and blogger outreach, as well as co-marketing partnerships. The latter are companies with whom you might co-create and/or co-promote a given content offer or related piece for mutual gain. In the case of the board decks at NextView, I focused mainly on blogger outreach under Third Parties, contacting a few blogs and companies that often publish link roundups of the VC/startup community. The last spoke on the Wheel is paid promotion. While NextView doesn't do any paid promotion of our content, this is still a viable, effective content marketing tactic when done right. My best experience using paid content promotion comes from my time at HubSpot. The HubSpot marketing blog has been around seemingly forever -- they were early adopters of content marketing. As a result, they get MOUNTAINS of traffic from search today, in addition to regular visits from their enormous list of email subscribers. But paid placement, which we tried using Outbrain, quickly became a top source of traffic for us once we tried it. And because we ran the Content Marketing Wheel, this paid content promotion wasn't just about views and other metrics that don't usually justify paid advertising. Instead, in our case, the traffic was being directed to that core offer either directly (to a landing page with a lead-gen form) or indirectly (to a blog post from our Atomization step that also linked to the offer's landing page). Our conversion rates on the offer was also much better than product-focused advertising -- 50% or higher, compared to 1-2% on product demos. In short, if you can afford even a small test, experiment with paid. If you're running the Wheel, this is about much more than empty views. I know what you’re thinking: This feels like work. That’s because it IS work — a lot of hard work, plus a lot of experimentation and creativity. No matter how badly we want it to do so, content marketing simply doesn’t scale like some forms of marketing and advertising. You need actual, creative human beings to power it. And if you're just starting out or lack audience, you also need to do scrappy things that don’t scale well to find initial traction. That’s what the Content Marketing Wheel is really all about: traction. You can’t simply create a great piece and hope people will find it. On the other hand, you can't simply over-promote a crappy piece and hope people will like it. You need to be systematic and regimented, learning as quickly as you can and following a set process that prevents you from stopping. The Content Marketing Wheel is built to do exactly that. For me, the practice of content marketing has always been about this Wheel. In the past, it was the theory I taught. In the present, it’s my day to day job. And whether you're starting or growing, I hope it helps make yours a little better. I hope you enjoyed this post and found it useful. If you did, please consider subscribing to Sorry for Marketing. I publish roughly one post per week on the subject of content marketing, typically about the need for good creative process and the physical production of content. Posted on January 21, 2015 by Jay Acunzo.